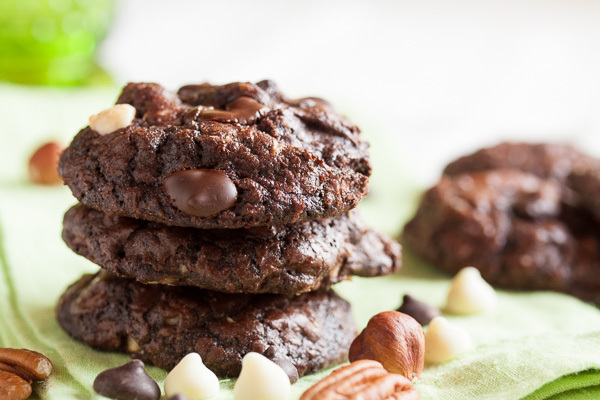 Triple Chocolate Chip Cookies | wanna come with? 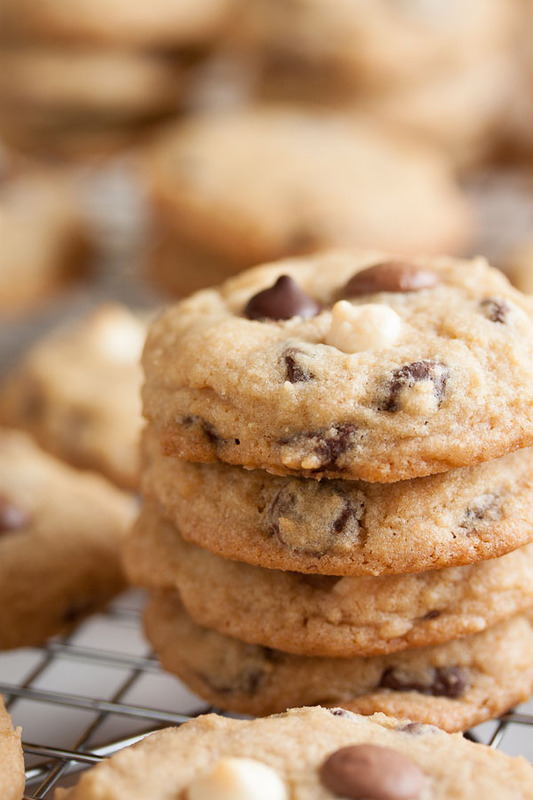 I was totally craving a basic chocolate chip cookie this week, and I’ve had this one bookmarked for awhile. This recipe is from one of my digital cookbooks – I only have a few of them, but I always forget about them! It’s so much easier to gravitate towards the physical cookbooks on my coffee table, with their beautiful photography, brightly festooned with post-it notes to remind me of the recipes I want to try. I’m a big fan of the convenience of ebooks though – especially for those of us who like to take novels on vacation – it’s much easier to carry around one little electronic device than a stack of paper books (I don’t know about you guys, but one novel is never enough). But the flip side is that as I mentioned, while I’ve had this book for awhile, I keep forgetting about it. So this is the very first recipe I’m trying from it. No complaints so far! I don’t think I’ll be forgetting about this book again. Fingers crossed, anyway. So, to recap. For novels? Big fan of the ebooks! For cookbooks? I definitely prefer the physical copies. I’ll admit I cheated and simplified the instructions for this recipe quite a bit. Originally the butter and sugar were creamed in 3 stages, but I just creamed them all at once. And the dry ingredients were to be sifted three times. I’m not a big fan of sifting unless there are lumps (like with powdered sugar or cocoa powder), so I just whisked them together as usual. Check it out, Joy the Baker agrees. And finally, the original recipe specifies that you should use good quality blocks of chocolate, chopped into thick shavings. Yeahhhh, I opted to just use good quality chocolate chips. 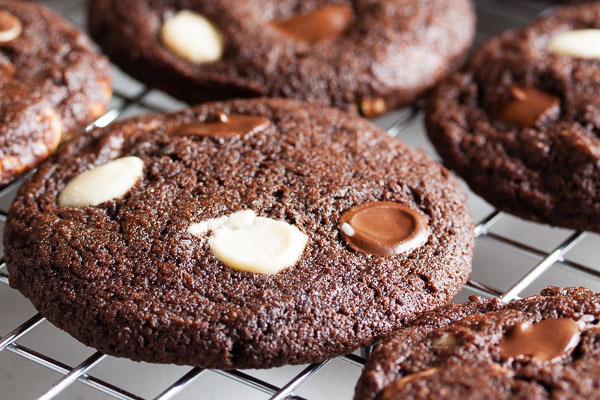 I’m going to leave the note to use chopped chocolate in the instructions, because that would probably make these cookies even better, but I didn’t have any blocks of chocolate, and my chocolate chips are good (Guittard for the white chocolate, and Callebaut for the milk and semisweet). I also increased the amount of chocolate (why not!) – the original recipe called for 4 oz of each type of chocolate, which worked out to about 3/4 of a cup. I upped that to a full cup of each (I like nice round numbers). And while one person complained “triple chip? that’s just too many chips!” (all while standing there inhaling 3 cookies in a row – ha! ), these cookies disappeared in no time. All 65 cookies were gone in less than 2 days!! That might be a record. 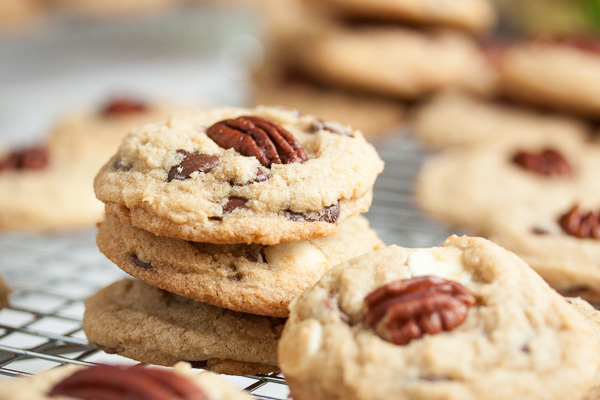 Adapted from Great Cookies by Carole Walter. The recipe says it will make about 48 cookies, but I got 65 using my usual slightly larger than tablespoon-sized cookie scoop. Turn the mixer down to low and add the dry ingredients, mixing until just barely combined. 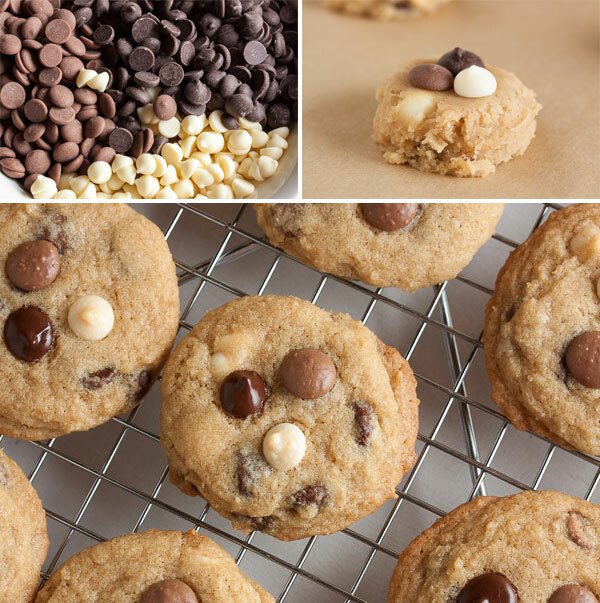 Remove from the mixer and add in the three kinds of chocolate chips either with a spatula or by hand. I prefer to knead inclusions in by hand to ensure they're distributed evenly. At this point I got a bit fancy and pressed one of each type of chocolate chip into the top of each cookie. 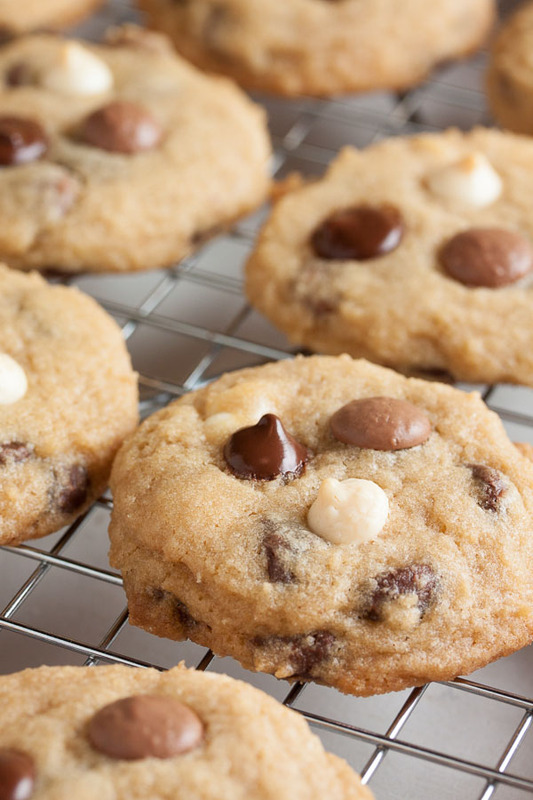 This is totally optional – there's a lot of chocolate chips in there already. I just thought it would look nice and give people a preview of what flavours are in the cookie.